Every day is Human Rights Day! On 10 December 1948, the Universal Declaration of Human Rights was officially adopted. This symbolic text was meant to celebrate and embrace universal human rights for all. Today, 10 December marks the celebration of Human Rights Day. It also coincides with the end of the international campaign 16 Days of Activism Against Gender Based Violence. Such timing symbolically links gender based violence and violence against women with human rights, and rightfully stresses that gender based violence is an international human rights violation. This year’s campaign on gender based violence focused on the effects of militarism and militarisation. It demonstrated that peace in the world will not be achieved without full and effective respect for all human rights, including in the home. At WILPF, the Human Rights programme advocates for the promotion and protection of human rights for all. We advocate for peace by looking at intersecting issues of disarmament, human rights, women’s participation, environment, social justice, peace, and security. We cannot ignore that all these are closely interrelated and interdependent. That is why WILPF’s Human Rights programme works tirelessly to end the compartmentalisation of these pillars in the international system. Our main goal is to prevent and confront wars and armed conflicts using a human rights based approach. On this very special day, WILPF’s Human Rights programme is happy to announce that our new brochure is finally available for you to read online! 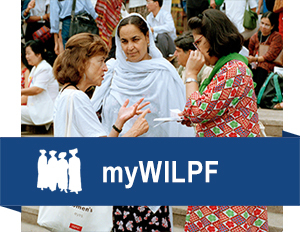 You will know everything about WILPF’s approach to human rights. Interested in human rights and wondering what you can do? The possibilities are endless. Join the Thunderclap created by the United Nations Office of the High Commissioner for Human Rights (OHCHR) to show your support for human rights to all your social media friends and followers. Like and share this blog on Facebook and participate in the discussion. Let us know what you think of Human Rights Day and what human rights mean to you. We would love to hear from you in the comments below or on social media. Don’t forget to follow us on Facebook and Twitter. Subscribe to our human rights newsletter to get the latest news directly in your inbox. Join us in April 2015 in The Hague, Netherlands, to celebrate 100 years of WILPF’s advocacy for peace and freedom for all. So get involved and spread the word about human rights today!